Op-Ed or Opinion Editorials are the articles in form of essays appear in the editorial page in most of the newspapers. For this reason also, these essays or articles are called ‘Op-Ed’. They are opinion editorials as the opposite side of the editorial page in the newspapers contains the articles or essays are contributed by the people, organization leaders, experts, not in the staff of the newspapers publishing company. Those who have a good knowledge about a particular topic can write an op-ed for a newspaper. Minimum requirements to write and opinion editorial in the form essay or article may be counted as topic selection, visual formation of the article, length of the content, source requirements for citations, refutation in case its being written in response to any editorial article or series, agreement or refutation, your solution, conclusion, drafting style and format, and the time to submit. Bearing more credibility to the reader, the Op-Eds generally are longer than a letter to the editor to exploit the opportunity to communicate your message with greater detail. Though guidelines to write Op-Ed may be prescribed by each newspaper, they vary very marginally. Following a generic framework of guidelines to write an Op-Ed is still a good idea. From the academic perspectives journalists are taught to follow four criteria of timeliness, significance, proximity, and human interest to demonstrate newsworthiness for the publisher of the newspaper. Here are a few easy points to keep in mind when you are writing an op-ed. Following these simple tricks, you can be assured to make your op-ed a success among the readers. The most essential element in an Op-Ed writing is timeliness as it may be written on focusing an issue which dominates the news. The issues mentioned in the writing should explicitly be linked to something which is happening or becoming the news. It means that to write an op-ed, one must be well aware about the current issues that are taking place in the world. A thorough knowledge about the event which you are going to cover in your work will surely help a lot to make the op-ed a success. An op-ed cannot be just a random article, like shooting arrows in the air. It has to be specific, targeting on a chosen topic. Numerous people will be reading your op-ed, so make sure that you do not write things which misleads the pack. Op-Ed need to be significant to assure the topic about which readers care as it should focus how the issue affects them. While you are writing an article for Op-Ed you need ask yourself ‘So what? Who Cares?’ Answering ideas to the two questions would keep you on track to have your writing significance to the reader. To know the proximity of your op-ed, it is advised to know beforehand the range of your audience. Are you writing for a local newspaper or a national one? This would surely make a difference in the content of the op-ed, as the relevant examples will vary accordingly along with other things too. For example, if you were to write an op-ed about the current US elections, you need to know that whether it will be for a local newspaper, a magazine or a national daily. The examples and references will change accordingly. You can choose the proximity of the news depending upon the reach of the newspaper. National daily may take your writing Op-Ed covering issues like US elections or the impact of the recession as an after effect of it. So local or national may be your criteria to have promptness of the proximity of the issue or issues covered in your writing Op-Ed. Everyone is having a busy day, working for their jobs, taking care of their children or completing their graduation. People would be holding the newspaper in their hands while on the way to their work, and see your op-ed. What next? Would they read it? Or just turn the page and have a quick view of the rest of the paper? That depends on you. Entirely. That how well you can make an impression on the reader’s mind with the opening lines of the op-ed. Your writing Op-Ed aims to evoke responses from the reader, so human interest in the topic become one of the main criteria to leave your reader impacted. Every reader is a busy person, so first few lines of writing should be grab the reader’s attention. Generally, Op-Ed writers pay attention to make their writing provocative and argue particular points of view on issues that are hitting the headlines of the newspapers. Remember, it’s not a creative English assignment! You are not asked to have flowery language, using the best and the toughest of the words to reflect your brilliant vocabulary or anything else like that. The agenda is to inform the people, which means the language has to be clear, crisp and simple. An op-ed should be written in a way, which even a lay man can understand and does not need to refer a dictionary to understand the words. ‘Plain English’ may be one of the best criteria to keep your reader engaged in the topic, issue and conclusion of your Op-Ed writing. Accuracy of the facts, spelling of the names, places of things add to your writing style to keep your reader interest. Along with this use of jargons and acronyms is to be avoided in the same pursuit. Every one may not be familiar with a complex vocabulary, synonyms, anonyms etc. so try your best to avoid all those. Now when you are sure about the topic and the audience, start writing the article with a good control over the information. You may know a lot about the incident, or things that may enrage the people or so. Hence, decide the amount of the information you wish to deliver. Make sure it is not offensive or mocking someone, or else you may land up in trouble later. Write a paragraph in the beginning which discloses the background information, and explain it all in the following paragraphs. Op-ed is not just another article printed anywhere just to have a view. It is your voice, your thoughts, your ideas. A direct way to talk with the people to discuss an event. Your op-ed should arouse to people to provoke discussion, controversy and response. It is like igniting the fire; make sure you light it first. Similarly, make sure that you invite the people to think on the topic further and discuss about it. That is the first thing which anyone will read. And I should be strong enough to engage the readers to go on further, creating a curiosity in the minds of the readers. Give a hint about your entire op-ed in just a few words. The title should be a smart one, which makes people think on the topic further, and make them read your article. The final summary of your ending lines should make your readers think on the issue, and urge them to know more about it. They should feel to know more about the event. A good op-ed will surely keep the people engaged and make them know more about a topic. 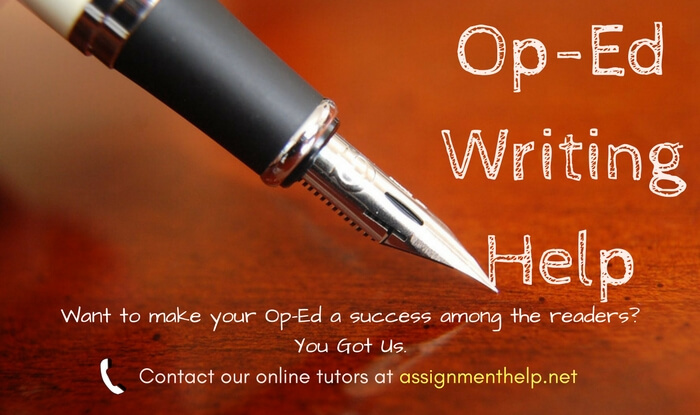 Need help with writing an op-ed writing assignment? Get instant help with how to write and op-ed essay outline and get your op-ed essay reviewed by our custom writing service tutors. Get inspirations from our op-ed essay writing samples for help with op-ed essay format as well as op-ed writing styles and score perfectly on your next writing assignment.